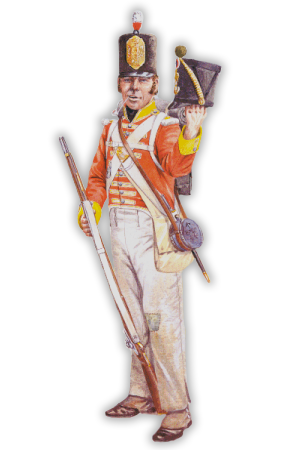 The 44th East Essex is an organised, disciplined and welcoming Napoleonic Wars British Line Infantry regiment. Our main goals as a regiment are to excel in both melee and ranged combat on the battlefield as well as bringing players together to play other modifications and games. The 44th requires that all members who enlist are mature regardless of ages we wish to ensure a grown-up and organised atmosphere, so anyone who does not show that will be removed. During events, discipline is enforced and members are expected to follow basic rules and regulations to ensure the smooth-running of the regiment. We encourage members to join TeamSpeak regardless if an event is occurring to meet other members and play with us. If you are searching for both an active and organised guard regiment then follow the enlistment instructions located further down the thread. In 1740, as Britain and France became embroiled in what was to become known as the “War of Austrian Succession” the British Government increased the size of the regular army by a further seven regiments to be numbered 54th to 60th. Colonel James Long of the Grenadier Guards was commissioned as Colonel of the 55th Regiment of Foot on 7th January 1741 and commanded to raise a Regiment. It remained in England for four years until being sent against the Second Jacobite Rising (1745-46). Relatively inexperienced, the regiment broke at Prestonpans (1745) and lost most of its strength killed, wounded or captured. This regiment kept the number 55th until the conclusion of the war with the treaty of Aix-la-Chapelle in 1748, where upon cessation of hostilities the ten marine regiments numbered 44th to 53rd were disbanded and the regimental numbers assigned to those regiments next in line. Thus in 1748, the 55th Foot became the 44th Foot, a designation it was to have until the territorial re-organisation of the army in 1881. It was to America that the regiment sailed again in 1776 to participate in the American War of Independence. Expansion of the army during the Napoleonic Wars resulted in the raising of the 2/44th (1803) and the 2/56th (1804), while the 3/5th was raised in 1813. The 2/44th was raised in Ireland, and it is perhaps to commemorate this and the many Irishmen who served with gallantry in the ranks of the 44th and 56th in their earlier years that both regular battalions of The Essex Regiment always marked St Patrick's Day by the beating of reveille by the Corps of Drums playing traditional Irish airs - a custom still observed today. The 44th served in Malta, Sicily, Spain and North America. In the latter campaign the battle honour "Bladensburg" was awarded for the part the Regiment took in the advance to and occupation of Washington, the American capital, 1814. The 2/44th in its short life crowned itself with glory, gaining great distinction under Lord Wellington in the Peninsular War and at Quatre Bras and Waterloo. It won for the Regiment the battle honours of "Badajoz", "Salamanca", "Peninsula" and "Waterloo". It was a party of the 2/44th, under command of Lieutenant W. Pearce, that captured the Eagle Standard of the 62nd Regiment of French Infantry during the Battle of Salamanca in 1812. This Eagle (only five were taken in battle in all the wars with the French) rests in the Museum and an Eagle badge is worn as an arm badge by the Royal Anglian Regiment. 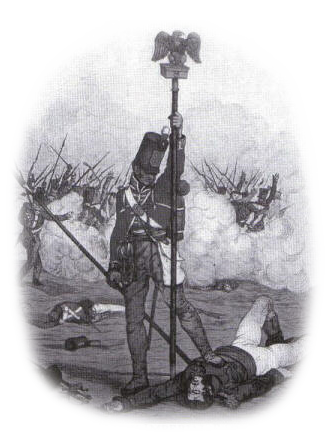 The gallantry of the 2/44th in the Peninsular War gained them the nickname "The Fighting Fours". 62e Eagle captured at Salamanca. 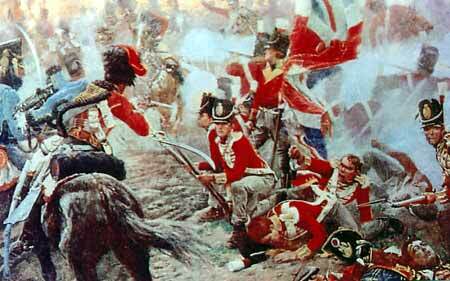 Battle of Salamanca, 22 July 1812 - the attack by Sir James Leith's 5th Division. At about 1640hrs the 5th Division, after enduring a prolonged period under fire from French artillery, began its attack on Maacune's division just above the village of Los Arapiles. When the 5th reached the crest of the heights they found Maucune's division drawn up in squares. In the ensuing contest, the British firepower broke the squares apart. The eagle of the 62e was taken by Lieutenant Pearce of the 44th English, who appeared in front of its bearer at the moment when he was taking it off its staff to protect it under his coat. They got involved in a fight, in which they were joined by a 2nd eagle-bearer, a French soldier and three English of the 44th. The French soldier was going to drive his bayonet into the Lieutenant, when Private Finlay shot him in the head, saving the Lieutenant’s life and spraying the eagle with the soldier’s blood. The two French bearers also died straight away, one of them killed by Lieutenant Pearce, who snatched the eagle from the hands of one of the dead, then nailed their trophy to a sergeant’s pike, carrying it triumphantly throughout the remainder of the battle, presenting it to Wellington the following day. Brevet Lieutenant Colonel Hardinge gained a medal for this victory and the 44th were permitted to bear the word Salamanca on the regimental colour. The battalion had Captains John Berwick Ensign William Standley and four rank and file killed two sergeants one drummer and twenty rank and file wounded at the battle. The Battalion then moved to quarters in Ostend until April 1815, when they where posted to the 95th British Infantry Brigade under the command of Sir Dennis Pack. The 2nd Battalion suffered 165 casualties during the Waterloo Campaign and was particularly hard pressed at Quatre Bras, where on June 16th Ensign Christie, despite receiving serious injuries, distinguished himself by saving the regimental Colour. After the battle of June 18th, the 44th marched to Paris, not returning to England until January 1816. In January 1816 the 2nd Battalion of the 44th Regiment of Foot embarked at Calais for Dover and on the 24th January was disbanded. The Officers received full pay until 24th March and all men fit for service were transferred to the 1st Battalion. 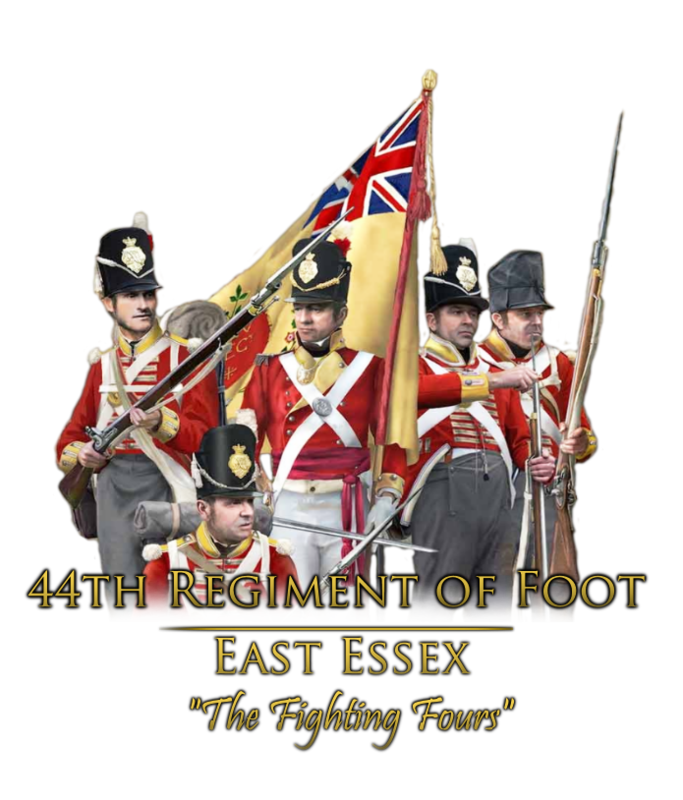 The 44th East Essex remained a one battalion regiment, winning more glory and honours until 1881, when on 1st July, as a result of the territorial reorganisation scheme, the 44th became the 1st Battalion, the Essex Regiment and the 44th East Essex ceased to exist. Gone but never forgotten. With thanks to Crumpet for the header & Murphy for parts of the history section. Lieutenant Colonel - 71st Fraser's Highland Regt.